Kinect Sports: Season 2 Review - This Is My Joystick! What would a motion sensing peripheral be without a quintessential sports game in tow? Kinect was never going to be any different, but that’s okay. Not only was the original Kinect Sports a highlight of the launch line-up, after a few beers, the competition of looking the biggest prat in front of your mates merits some genuine laughs. So who wouldn’t want to make a sequel, apart from a weird dude that didn’t like money, or a timid dudette allergic to success? Question is, did Rare use up all of their cool party tricks last time, or have they been saving up their best ideas for a sequel? It’s fair to say that Kinect Sports: Season 2 is better suited for our friends across the pond. Whereas the original title featured Bowling, Football (not Soccer), Boxing, Track and Field, Table Tennis and Beach Volleyball, this year, Rare have incorporated Golf, Darts, Baseball, American Football, Skiing and Tennis. While there’s certainly a great mix of games in Season 2, appreciated by people all over the world, it’s the Americans that’ll feel more at home with touchdowns and homeruns. Absolutely nothing wrong with that, it’s clear to see the potential of using Kinect playing these sports, but does promise contribute favourably to success? With such varied game types, as you might expect, Season 2 is a mixed bag in terms of control. Some games work well with Kinect, whereas others would be best left forgotten. From the outset, it’s clear to see Kinect Sports Season 2 is a rushed release when compared to its quite polished predecessor. A key example of that would be Darts. Darts is an extremely precision based sport and your accuracy is never going to be genuinely replicated unless you’re stood in front of the dartboard with a dart in hand, something Kinect can never offer you. As such, the aiming is always a bit off, and there’s definitely a delay in the sensor picking up your arm gestures. What makes it even more awkward is the unsteadiness in your aim when you know your arm is perfectly still. As such, you’ll rarely hit your intended target, always falling just shy of it, regularly making you question the point in playing in the first place. Have to say though; I love how you can distract your opponent behind their back when they’re trying to concentrate. It’s even funnier when the crowd reacts and the player turns around to look at you with such disdain. Brilliant! Gameplay wise, however, the same rule applies to American Football. As a sport, its pacing is filled with a lot of stopping and starting, and trying to replicate that through Kinect Sports just doesn’t feel appropriate. The general feeling of the sport is there, enabling you to jog on the spot, and pass the ball, but it all feels entirely constrictive. Of all the sports enclosed in the package, this one feels the most gimmicky and tacked on. Baseball works well, and is quite the attractive diversion. There’s a certain joy about pretending to hold a baseball bat in front of Kinect, and when the ball comes at you, pulling off a swing that would make Babe Ruth cower in his grave. Pitching also works surprisingly well, being able to adjust the spin on the ball, combining that with straights. If you’re playing against the A.I., the game will actually tell you a bit about the player you’re pitching to, and will tell you their weakness, whether it’s a fastball, low ball or curveball. By adhering to this advice, you gain additional experience points, which is a nice touch. While it’s by no means the definitive Baseball experience, it’s a very entertaining pastime. Tennis is in the same league as the Baseball, in that it works well, but it’s definitely not a title you should take too seriously. Volleying and serving will generally send the ball the same direction every time, and games do play out quite repetitively. It does, however, create some excellent rallying opportunities and catching your opponent off guard with a backhand instead of a forehand is as satisfying as anything else you’ve experienced on Kinect. Really, though, this has essentially the same physics and feel as last years Table Tennis, which isn’t a bad thing, but it does feel a bit tired and lazy for a new release. Skiing is a mixed bag. Arching your knees to gain momentum, and jumping on the spot to pull off big jumps would obviously make sense in context of skiing, and Kinect is very good at picking that up, however, swivelling your hips to turn the corners is patchy at best. When it works, Skiing is a real pleasure to play, but because speed and timing is everything in a sport like this, and with regular hiccups in detection, usually at inopportune moments, it’s not uncommon to feel frustrated at the end of each run, seriously debating whether or not you can be bothered to give the game another chance, even though you know an element of fun can be had. Of all the games, however, Golf shines as the greatest triumph. There is actually a need for selecting your club, for judging your shots, and considering your approach. If you’re putting, take your time, and don’t rush it. On the flipside, when teeing off, don’t be afraid to back your back into it! With a combination of the game’s control scheme and Kinect’s sensor, your actions almost always seem akin to your own individual attempts, and not a bamboozled, half-assed replication. 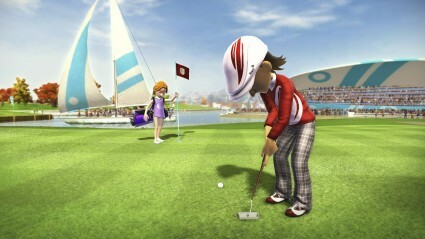 While it lacks the seriousness of a Tiger Woods, but isn’t quite as quirky as Crazy Golf, the golf in Kinect Sports 2 is good fun, and without question, the highlight of the Season 2 Package. Darts is finicky but fun. The engine hasn’t changed from Sports 1 to Sports 2; your Avatar is still the star of the show. Of course, the different games do present some unique clothing opportunities for your avatar as well as place them in cool, new environments. One minute you’re decked out in Darts garb, doing your best Phil Taylor impression, the next, you’re surfing through the snow, thrill-seeking with the best of them. Even though the games are different however, this still looks and feels like its predecessor, and will be instantly familiar to anyone who enjoyed last years Kinect Sports. Peter Dickinson is back, and with a vengeance, also some new lines to deliver. The familiar voice guides you around the new menu layout with ease, and introduces every single video documenting your arm swaying and body spinning. It just wouldn’t feel like Kinect Sports without him. Even more hilarious, however, is the backing music for the highlight videos. Barbara Streisand anyone? Seriously, few games in 2011 made me laugh out loud as much as Kinect Sports did going back over my highlights. Every game sounds like it should, with call-outs in American Footy, and score announcements in Tennis. Season 2 is very authentic to its source material through all of the charm and silliness. You really do feel like you’re competing in your respective sporting arena each time you play. 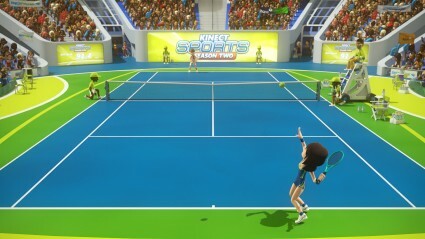 As with the original Kinect Sports, Season 2 is full of multiplayer opportunities, whether you want to play together against the computer, against one another, or even have teams against teams. 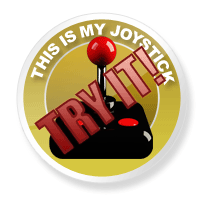 You can also go online, play your friends, and even challenge their scores if you feel so inclined. Also, as before you can upload and share your videos, and even rate others. The beautiful thing about Season 2 is that it is designed to play with other people, whether they’re in your living room or the other side of the world. This, for me, is what sets it apart from Wii Sports, and truly makes this the party game it was always set out to be. Undoubtedly, the game truly comes alive when it’s experienced with others. 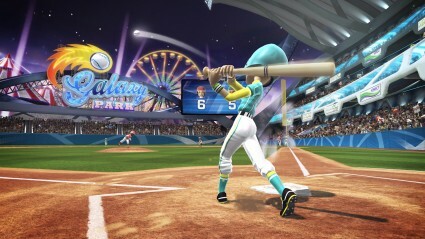 Kinect Sports Season Two is a bit of a tired sequel, filled with far more hiccups than should be. It’s obvious the development time was accelerated to meet demand, and, as such, it’s not as polished or refined as its predecessor. There’s still a lot of fun to be had here, and some of the experiences definitely make for entertaining Kinect romps, but it’ll all become very familiar, very quickly, unfortunately bringing its longevity into question when compared to the original launch title.